What is U3 technology and what sets U3 flash drives apart from the rest? In simple terms, its because their extra feature allows to run software and personal settings independent of the host computer. Previously, a USB drive was limited to store and transport files. But with U3 technology the same can be done with games and applications now. All under password protection and without leaving a trace! The only thing you do depend on is that the host computer runs Windows since U3 is only compatible with Microsoft’s operating system (from Windows 2000 SP4 upward). Flash drives equipped with this functonality are called U3 smart drives. Once they’re plugged into a computer, the U3 launchpad starts and enables the user to run pre-installed software as well as download compliant applications. The scope of U3 software is quite impressive. You can browse the internet with Firefox and take care of your emails with Outlook or Thunderbird. You can chat with your friends via Skype and send files via YouSendIt (up to 2GB). You can also run anti-virus programs like McAfee or Avast. Or you can use RoboForm to automatically fill out forms with your pre-stored information. Back-ups and photo editing are possible too. But best of all, there’s a wide variety of U3 games you can play, including Big Fish Games. There’s puzzles like Sudoku or The Rise Of Atlantis, action via Fizzball or Monkey Business and various forms of Mahjong. Also board, card and word games. Companies that are marketing U3 smart drives are Memorex, Verbatim and Toshiba. 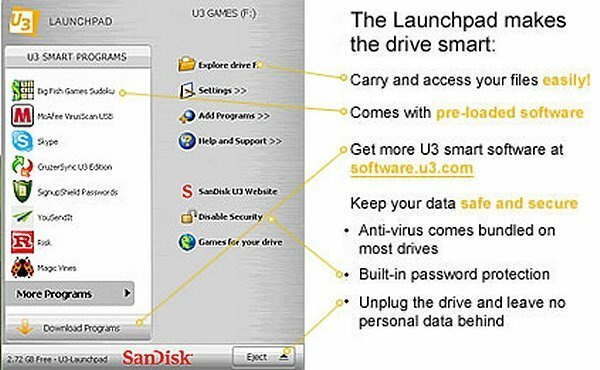 The biggest distributor is SanDisk as almost all of their Cruzer flash drives feature U3 technology. But that’s no surprise as they co-invented it, together with M-Systems. Since most of these flash drives are pretty cool by themselves it’s also possible to remove the U3 and use them as regular storage devices. This may actually be a vital option in case your system has problems handling the extra functionality. Luckily it’s easy to remove as the uninstall utility is included. Let’s conclude with an interesting question. What gives U3 technology its odd name? According to the inventors, it represents three “you” statements. “Simplified for You”, “Smarter about You” and “As mobile as You”. For more information feel free to check the U3 website. U3 looks promising! This serves as the vital missing link with USB drives all these years. Wonder when U3s will hit the market! .-= computer maintenance´s last [blog post] ..Update Device Drivers =-. This is excellent information. I have been looking for such things a long time. I guess I could install an antivirus program to run on machines when I drive around fixing them, right?! Felix, sure. If you click on the software central link you can see that there is antivirus as well as antispyware offered. Cool DT. Thanks a lot. I will certainly check it out. I cant believe that the U3 is bidding off at such a low price! pretty amazing! am i too late to bid now? because I know ill never get it at this price ever! Im not sure what auction caught your eye but usually Ebay listings have a re-occurring nature, high or low prices. If you cant bid now, just keep checking back. What a brilliant idea the U3 flash drives are. This would be a great pressie for my son who spends every waking moment on his laptop. After college anyway! I like the way you can remove the U3 and use the flash drives as regular storage drives. Love the sound of the U3 games too! Wow! U3 is indeed better than an ordinary USB. One of my major concern with USB is that I have certain files that run on specific programs; but with U3, i don’t have to worry about this anymore. I have the software with me, wherever I go. It’s interesting how they just keep getting smaller and smaller.. I can’t wait for the terabyte thumbdrive. My only question is what the hell would you store on it? .-= JR @ franchise info´s last blog post ..- =-. A Terabyte? Hmm, let’s see…the history of the world? No, that would be Terra-byte. These look decent…I’m waiting for them to get up to a terrabyte! Yeah, a terabyte flash drive would really come in handy alright! i’m sure we’ll see it coming sometime soon! I bought an expensive passport drive as I was concerned about the durability; and guess what? It got dropped off my hand only after 15 days and its media got corrupted Wish I saw this post earlier and bought a 16 GB U3. If you already have access to windows, just download the U3 removal tool from U3… http://www.u3.com/uninstall/. It removes the software and repartitions the flash drive. The only annoyance is the web page telling you what a horrible thing you are doing by removing the software that you are sure to need. sure there are. Check out my posts on 64GB, 128GB and 256GB flash drives. Im sure these will fulfill your needs? what exactly is the problem? Your best bet would be to consult SanDisk customer support or a tech forum like TechSpot. Good luck! I can’t go anywhere without my U3 64Gigger! .-= Bubba William´s last blog post ..Youda Safari =-. This is a great gadget. It removes the software and repartitions the flash drive. The only annoyance is the web page telling you what a horrible thing you are doing by removing the software that you are sure to need. Thank was great. Looks like a great gadget… We will be suggesting to our clients. I lost all my games from my usb sandisk (atlantis , Magic Vines and Mystery case Files. How did you lose them? ?